CHICAGO (AP) — Older white Americans are nearly twice as likely as African-Americans to say they've saved enough for retirement, a new poll found. "Having good saving habits is good but black and Latino workers are just always worse off and it makes every aspect of saving for retirement harder," said Matthew Rutledge, an economist at the Center for Retirement Research at Boston College. Four in 10 older Americans say they think they'll outlive their retirement savings. "Black and Latino families benefit from being close," Rutledge said, adding that family members help to care for children and the elderly. "But it doesn't pay off when compared to whites family's (financial) contributions." "They have learned better savings behavior from the previous generation," he said. "Older Americans who received financial help from family are less likely to have racked up credit card debt or student loans. They can save (for retirement) rather than paying off debt." The poll showed whites are significantly more likely, compared to African-Americans and Latinos to say they have a retirement account. They're also more likely than African-Americans to say they will have income from the sale of physical assets. But even when it comes to the most basic form of income during retirement, whites are more likely to say they will receive Social Security payments — 82 percent compared to 62 percent for African-Americans and 60 percent for Latinos, the survey found. The situation is so dire that some older African-Americans and Latinos have no sources of income for retirement —14 percent compared to 4 percent of whites, the survey found. Maria Villanueva, 69, is one of them. Villanueva doesn't collect Social Security payments because she didn't pay into the system. Villanueva immigrated illegally to California in the 70s to work as a farmworker and became a legal resident after the Immigration Reform and Control Act was signed into law. The single mother worked as a domestic worker but was paid in cash. "I didn't know I had to pay into Social Security," she said in Spanish. "All my life I've taken care of everyone except myself." Villanueva hoped she would be able to work into older age but she can't because of various chronic illnesses including diabetes and arthritis. She now relies on government assistance and food stamps. She provides for her 15-year-old granddaughter. "I try not to think about the future because I don't know what's going to happen tomorrow," she said. "What if I go to sleep tonight and I don't wake up tomorrow?" Retired members of minority groups tend to have lower incomes and are more likely to describe their financial situation as "somewhat poor or very poor" compared to white Americans. Black Americans were also more likely to say they sometimes fall behind on bills, the poll found. John Jackson, 66, of Fort Lauderdale, Florida, contributed to an Individual Retirement Account when he worked as a manager. Now, two years into retirement, he said he's not sure if his savings and Social Security will be enough. Jackson, who is black, says there are many people worse off than him and that's why he doesn't like to complain. Worst case scenario, he said, he has a big loving family who could take care of him. "I know God will take care of me," he said. 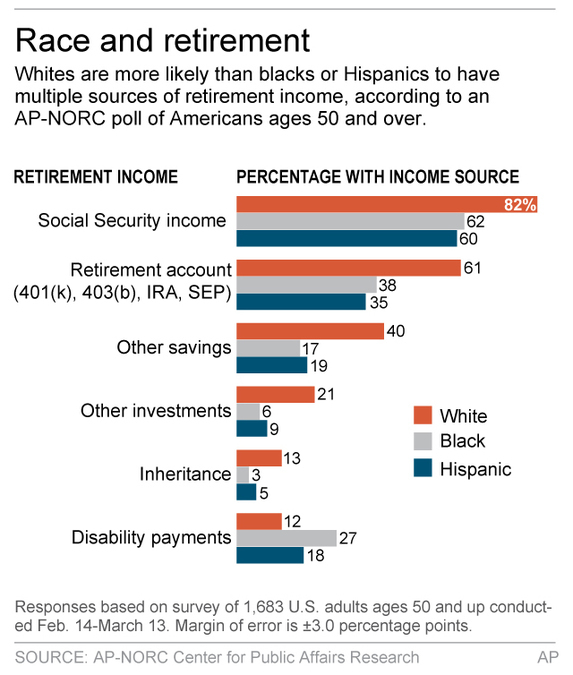 Some white Americans also are fearful about having enough for retirement. For example, Karen Brooks, a 52-year-old university professor living in a suburb outside Seattle, said she's concerned whether she's saved enough. Brooks is, by most standards, better off financially than Jackson. She has a pension from her work as a school teacher. She is also contributing about 15 percent of her current income to a retirement account and she may even receive a small inheritance. But her biggest source of worry is that she didn't save when she went back to graduate school. "I'm pretty smart and I've done well," she said. "I'm saving for retirement but I don't know if it's going to be enough. It's frightening even talking about it now." It involved interviews in English and Spanish with 1,683 people aged 50 and older nationwide who are members of NORC's probability-based AmeriSpeak panel, which is designed to be representative of the U.S. population. It includes oversamples of 332 African Americans and 308 Hispanics. Results from the full survey have a margin of sampling error of plus or minus 3.0 percentage points.